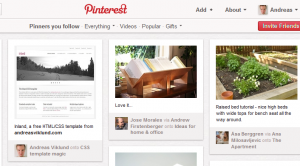 Pinning content from andreasviklund.com on Pinterest is perfectly OK. I encourage it, and appreciate it as it helps others find my work. If you are inspired by the templates and themes that you find here, do not let scary blog posts like the one above stop you from using Pinterest – atleast not for images you find on this website. Interesting article. I am curious how this playes out in the future.